UPDATE: The deadline for application has been extended! Now you have until Tuesday, October 23rd to submit your application so stop procrastinating and get to swedeing! Need a little help creating your swede? 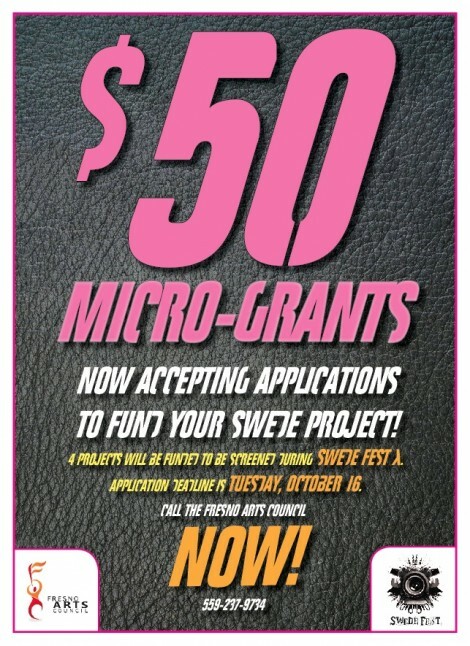 The generous folks over at the Fresno Arts Council announced today that they will be offering $50 grants towards the creation of your entry for Swede Fest X. Use the money to buy cardboard, art supplies, pizza for your crew, WHATEVER it takes to create the most awesome swede your imagination can create! On top of the money, the winners of the grants will be guaranteed a spot in festival lineup and will be screened at the Tower Theatre on Sunday, November 11th. There are four grants to be awarded so don’t hesitate to submit your application. “So wait, all I have to do is apply for it?” NO! You think it’d be that easy?! Along with your application we want you to get artistic and create a hand drawn movie poster for your film which, if you are chosen, will be displayed at the festival along with your entry! So bust out your crayons, color pencils, markers or whatever you need to put your vision to paper. The deadline to apply for the grant is Tuesday, October 16th so you need to hurry! And remember, Swede Fest X entries are due by Monday, November 5th at 11:59 p.m.
Download the application right below here for more details and get your swede on!